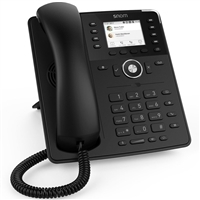 Snom IP phones are engineered in Germany to be robust and elegant. With advanced features, crystalline audio and intuitive software, Snom VoIP phones range from executive to entry-level desk phones. They support the open SIP standard, making their phones widely interoperable with VoIP platforms, which has led them to be popular around the world. When you choose Snom, you're choosing German-engineered greatness. IP Phone Warehouse is a certified Snom reseller. All Snom products we sell are backed by a manufacturer authorization.